Get a Big job done in a Small Space! fits under a sewing cabinet or table and can even be configured to sit on the sides of a table. You can position it multiple ways for your sewing space! It assembles in less than 10 minutes without tools. As small as you need - as large as you need! Eight Flex poles provide three levels of lift capacity: lightweight (thinner poles); medium (thicker poles); firm (combination of lightweight and medium poles). Most quilts will use the lightweight lift capacity but heavier fabrics and batting may benefit from medium or heavy lift. 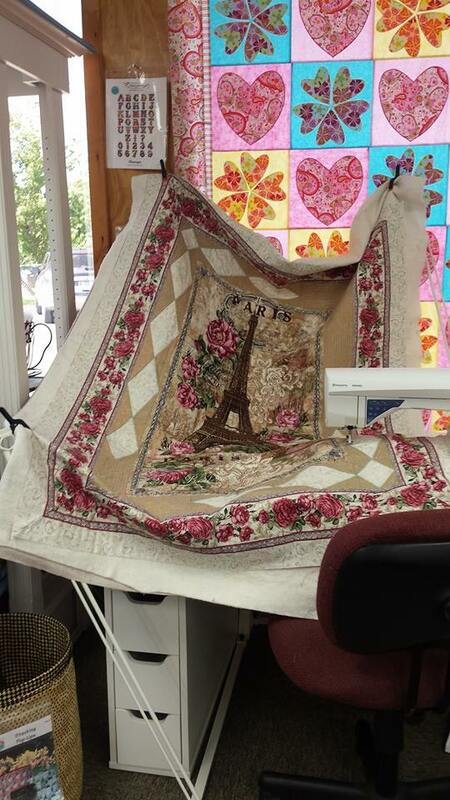 you can see this machine is on a small table and the frame sits around the table -- works with the smallest spaces! !